Separate the egg whites into a medium bowl, and save the yolks for something else. Stir in the vanilla and the 2% milk. Whisk until just combined and set aside. In your mixer, with a flat beater attachment, add: cake flour, white sugar, and baking powder. Beat on Low for 30 seconds. Add butter and the buttermilk. Beat on Low until combined, and then beat on Medium for 90 seconds. Add the food colouring and blueberry juice. Beat until combined. Add half the egg white mixture and continue on Medium speed for 30 seconds. Add the remaining egg whites, beat another 30 seconds. Spoon into muffin tins. Bake 19 min or less. Immediately transfer to cooling rack for at least one hour before frosting. 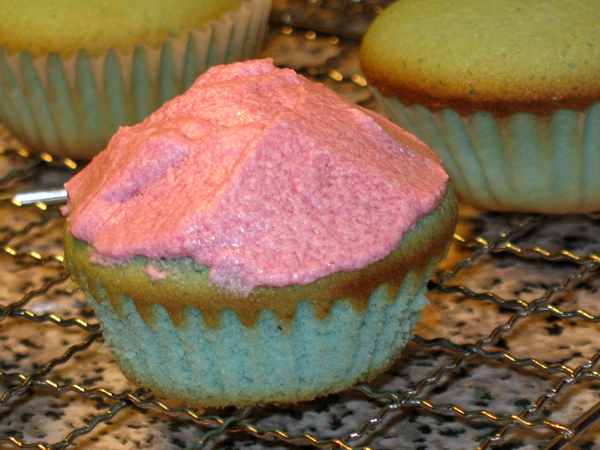 Make your frosting by combining the butter, icing sugar, milk, lemon juice, and blueberry juice. Beat until smooth. If frosting is runny add more sugar.